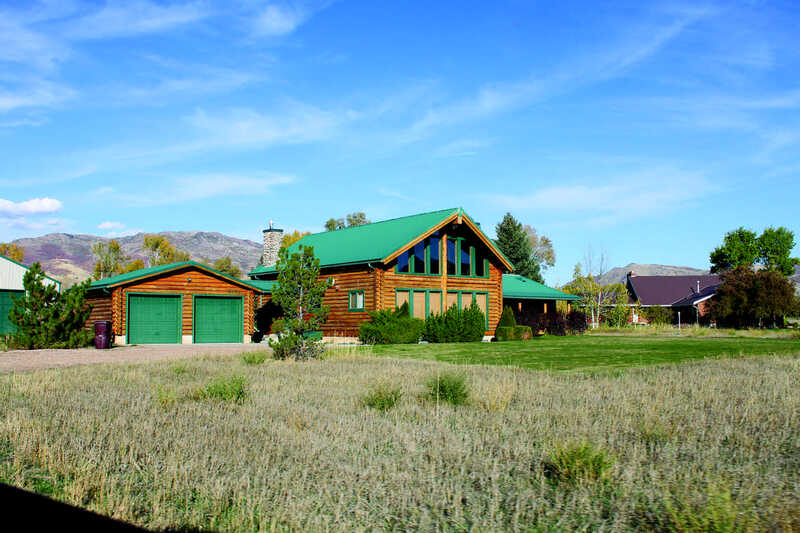 There is little doubt that buying an existing log home will always be less expensive than building your own. Land prices can be sky-high, and construction costs are continually escalating. But when you are purchasing a log home, what is fixable and what is alarming? Here are four warning signs to look for. Termites are the first thing buyers ask about. Log homes do not necessarily attract termites; those nasty critters love rotten and damp wood, which should not describe a home you are buying. But yes, if the logs touch the ground, you could have a problem. Normally there should be at least 10 to 12 inches of foundation between the ground and the first course of logs. In the unlikely event you have a termite infestation, you should see pencil-sized mud tunnels running up the foundation. Carpenter bees and ants are another possible infestation. They don’t eat wood but burrow honeycombed tunnels for their nests. If you see a little pile of sawdust, something is going on; carpenter ants or bees leave this telltale sign. Of course, a professional insect inspection is part of the home-buying process, and infestations are treatable. This is usually caused by constant exposure to moisture. For instance, log homes more than 20 years old tended to be built with shallow overhangs. As a result, the lowest courses of logs get rained on, and even the corners are often dripped upon. These are the most likely places you will find rot (your home inspector will poke the logs with a screwdriver to confirm it). Check for gutters and see if they are working properly. If rot has taken hold, there’s not much you can do except replace the individual logs. Companies that specialize in corn blasting and re-staining will usually be equipped to perform this task, but it won’t be cheap. Inspect around the window and door frames; they could also be the first to show signs of rot. If the window itself is wood clad, it is not always easy to maintain. Are there storm windows? Or, if newer, how are the thermal seals holding up? A houseful of broken thermal seals can be very expensive to replace, and log homes can have more than the usual number of fixed windows. Dormers are usually framed with log or wood siding. The edges where the siding meets the roof are another vulnerable area. If not flashed properly, the edges could start to show rot — an invitation to insects. Water should bead up if splashed on to a good coat of stain. But if the coating is shot, you can usually tell by looking at it. Is the stain splotchy? Can you see wood wearing through in places? Is it plain-old ratty looking? If the stain is worn but even, probably a new coat will serve. If it’s been more than 10 or 15 years since the house was treated, you might be looking at corn-blasting the finish down to the raw wood and then re-staining. This work is incredibly expensive (I was quoted $7,000 for just one wall), but you could use that fact as a bargaining chip with the seller. Carpenter bees love logs. They love exposed wood even more. They don’t like stain, though, so a well-treated log home can be resistant. However, exposed ends seem to be the first surface they attack, as well as fascia boards (along the roof edges) and wooden soffits (underneath the roof overhang). Look for perfect half-inch round holes. An occasional hole is inevitable, but if you spot a number of holes, you might have a problem; the bees leave long tunnels inside the wood. Carpenter bees are very difficult to treat, especially if the holes are unreachable. If the log or fascia looks like something took a bite out of it (in other words, a big, irregular chunk is missing), this is probably woodpecker damage. Woodpeckers could be going after insects or larvae; sometimes they are just being territorial. These tenacious birds are difficult to discourage, and their damage is unsightly; a wood fill seems to be the likeliest fix. Most other issues are the same as you will find in any house. A good home inspector should have no problem with a log home. If yours seems uneasy about it (this can happen), by all means find somebody else. When old logs need a good cleaning to remove worn finish, do-it-yourself homeowners have four options: pressure washing, media blasting, chemical stripping and sanding. Pressure washing uses high-powered water jets to remove surface contaminants. Easy on the p.s.i., however, so you don’t disrupt the wood surface. Media blasting uses corncob grit, walnut shells, glass beads, baking soda, dry ice or recycled crushed glass to abrade the finish off the wood. Crushed glass is very efficient, relatively inexpensive and does not impregnate the wood with organic material that can later mold. Chemical finish removers don’t dissolve finishes. They soften them. Use a pressure washer to remove the residue. Before buying any finish remover, test a sample on your existing finish to see how well it works.